So, my last post was a long, long time ago. I did mention I would be away for a while; however it would be a lie to say I have been in India this entire time. My excuse is valid, I would argue, because health related issues always are aren’t they?! And let me tell you, I don’t think I know a single person who goes to India and does not suffer even the slightest of ailments. That’s just the charm of India – chaotic, unclean and polluted (hence those ailments) crossed with vibrant, beautiful and unbelievably tasty! 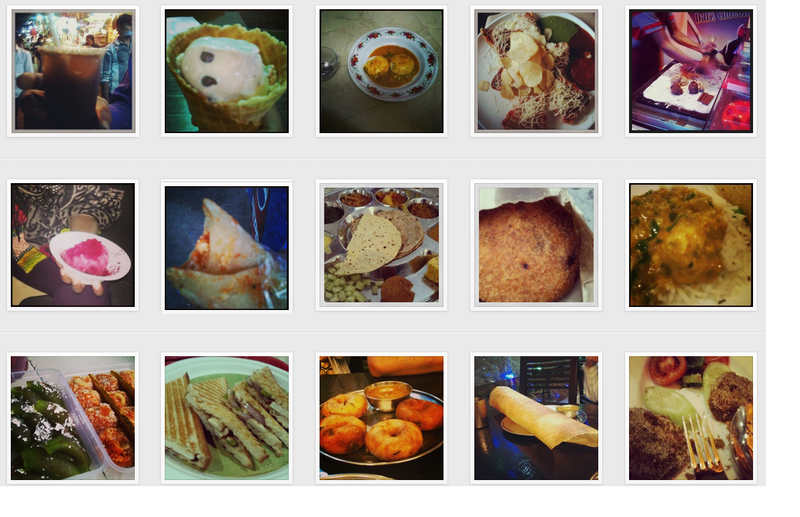 Just a selection of some of the amazing food I ate in India! Talking of tasty Indian food, if there is one thing that India does best in this world it has got to be cheap, moreish, street side snacks – my favourite hands-down has got to be pani puri (for those of you who don’t know what pani puri is, check out this link). I love the idea of food you just shove it in your gob. No cutlery. No fuss. No half bites. And that is exactly what pani puri is. You get the whole experience in one mouthful. Going with the vibe of “shove it in your gob/ no cutlery/ no fuss/ no half bites” kind of food (I can see this phrase is totally going to catch on... or maybe not) coupled with an over excited trip to the supermarket stocking up on all things “world food, aisle 17”; this week I rustled up these tempting sticky and chewy yet crunchy and moreish Japanese delights, with an exotic sounding dipping sauce – my Japanese Patties with Ponzu Sauce. For any Japanese aficionados out there, it is fair to say this recipe is not strictly authentically Japanese. I was completely experimental with my choice of vegetables (and slightly biased towards those which I like). I call these Japanese patties due to my use of rice flour, having been inspired by a similar method of “patty” making (although I am 100% sure nobody in Japan would ever describe them as a patty!) by that outstandingly creative chef Nobu Matsuhisa, you know, of highly acclaimed and somewhat fashionable restaurant Nobu. His recipe used daikon as its vegetable of choice, which works really well (obviously) and is surprisingly easily available in large supermarkets and local grocery stores – it’s definitely worth trying with daikon, just substitute the courgette in my recipe with daikon. The sauce though, that is Japanese, and not only by name. I’ve added some freshly chopped chilli to give the sauce a bit of a kick. But the real zing of this dipping sauce comes from the orange juice (which is often lemon or lime juice or both in other Ponzu recipes) which makes Ponzu taste like a kind of Asian vinaigrette. 1) Start with the ponzu sauce. Simply measure out the ingredients and whisk together. 2) Now for the patties. I like to make the courgette and sweet potato separately because this makes a more interesting patty, aesthetically and texturally. First it’s sweet potato. – Peel and mash the cooked sweet potato. Add the spring onion, a pinch of salt and pepper to taste and the truffle oil (don’t ask why but it just adds a little something). Mix well. Next add the rice flour a bit at a time. You want the mixture to become much drier like a crumble mix. Set aside. 3) Now it’s time for the courgette. Peel the courgette in alternate stripes (the skin can be bitter and removing some of it removes some of that bitterness). Grate the courgette. Add a pinch of salt – this will draw out all the moisture. Squeeze the courgette in your hands to remove the excess moisture. Discard the courgette water and put the courgette into a clean bowl. Now add the rice flour – again you want a dry mix. 4) Combine the sweet potato and courgette mixtures into a ping pong ball sized ball using your hands. You should be able to get about 25 out of this recipe – but I only made half and put the rest in the fridge for another day. 5) Steam the patties for about 15 minutes. Lightly oil the surface on which the patties will sit to ensure they do not stick. Keep an eye on the water level in the steamer as if you run out of water the pot starts to burn and your patties will be adorned with an acrid taste – not pleasant! If you do not have a steamer you can make a make-shift one! Simply place a heat proof bowl upside down in a deep sided pan or wok. Get a dish with holes to place over the top or a wide based sieve, balance on the over turned bowl. Get a lid to cover and BOOM – your own make-shift steamer! 6) Toast some sesame seeds in a dry pan until slightly golden. 7) Once the patties are cooked shallow fry them in a little oil for some colour, keep turning so they are coloured on all sides. Immediately dip in the toasted sesame so the seeds stick and you’re ready to serve alongside the Ponzu sauce.